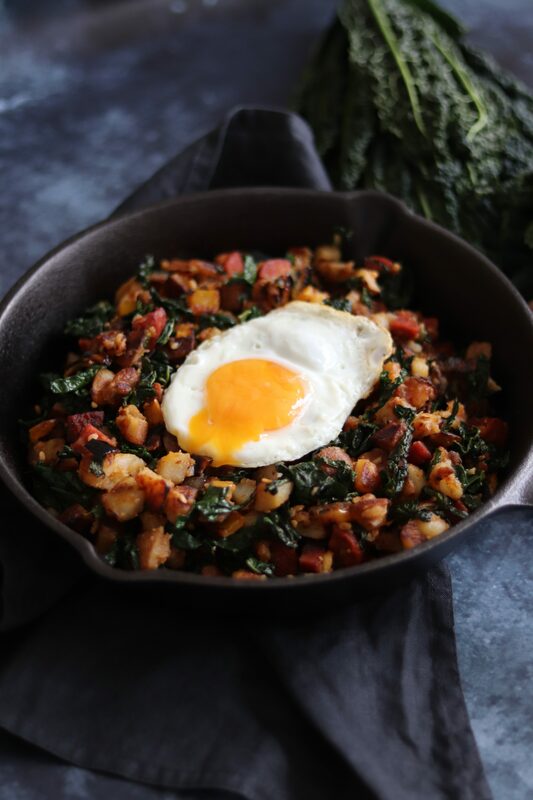 This Chorizo & Cavolo Nero Hash has quickly become a favourite and regular recipe in my house! It is so delicious and perfect at anytime of day. As I have mentioned in previous posts, I have been ordering organic vegetable boxes for a couple of months now. The company I order them from let you be extremely flexible with what you have in your box. They provide you with a set box each week but you can swap any vegetables you don’t fancy for one you do. This is great, but after a few weeks it meant I was playing it a bit safe. So a few weeks ago I decided to make as few swaps as possible and try some new vegetables. Cavolo Nero was available that week and although I had heard of it; I hadn’t tried it before. The recipes I saw when I had a quick look were hearty stews and soups which all looked delicious. 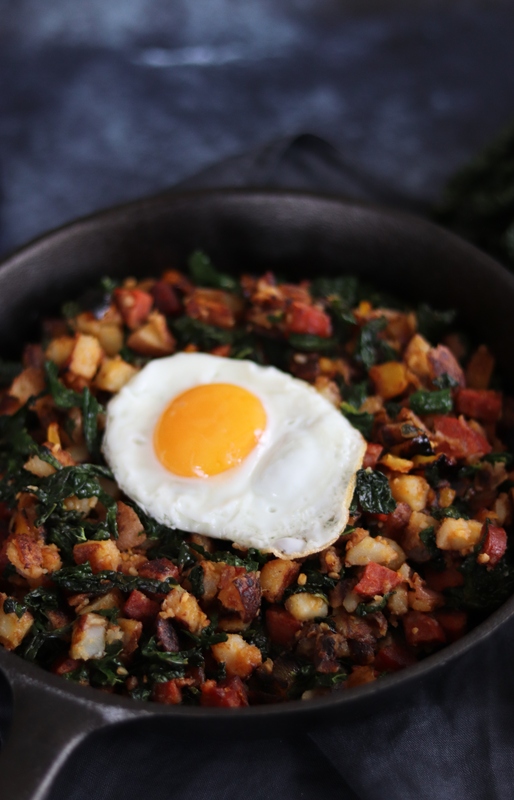 Instead, I decided to tweak my Mexican Eggs recipe to come up with this Chorizo & Cavolo Nero Hash. 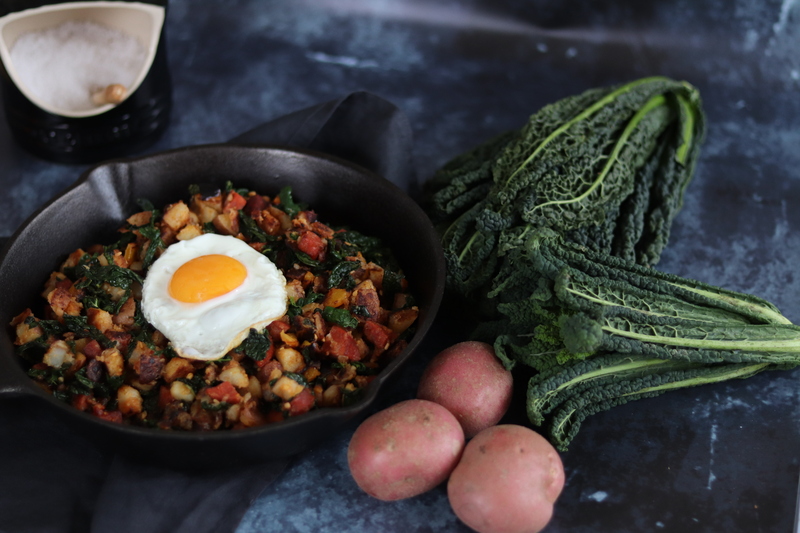 Since I first made this Chorizo & Cavolo Nero Hash a month or so ago, we have had it every week since. We absolutely love it! It is a great mid-week meal because it is quick to make. The only step that takes a few minutes is chopping the potatoes. That is because I finely dice them which means they cook quicker. If you would prefer you can cut them into bigger pieces and then just cook them for a bit longer. 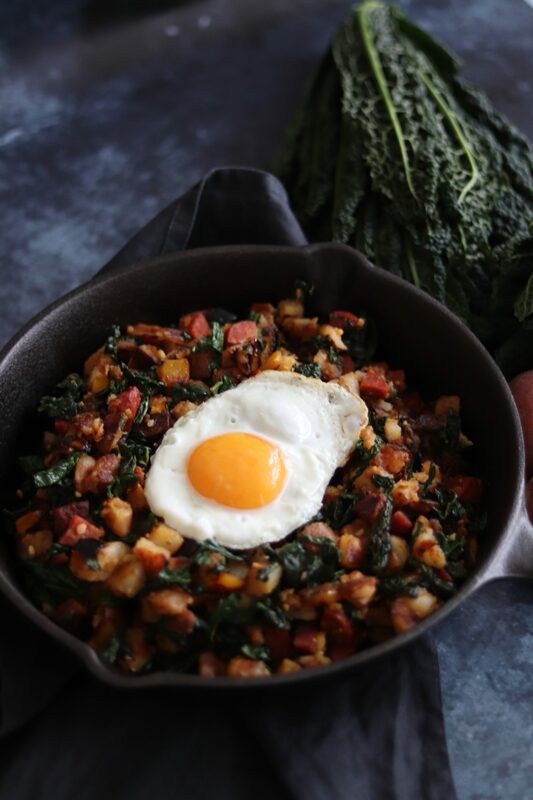 Cavolo nero is also known as black kale and Italian kale to name a few. It is packed full of nutrients and iron as well as looking quite pretty in my opinion! 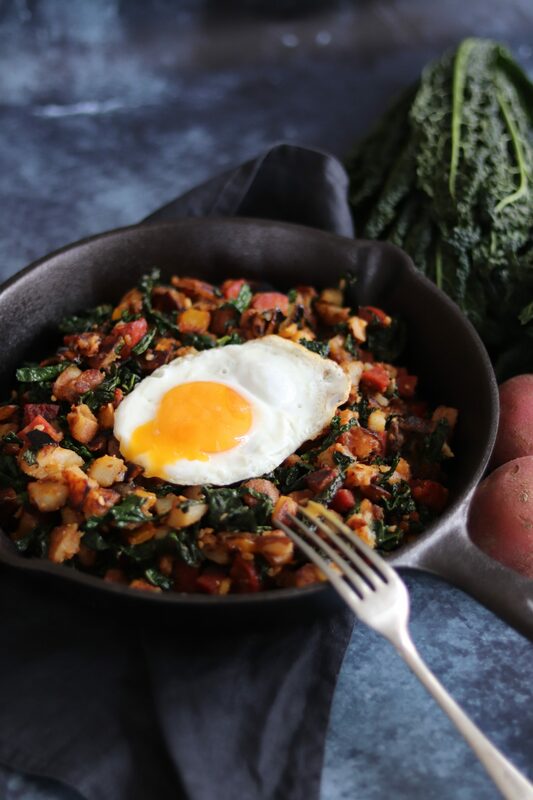 I really recommend that you give it a try, but if you decide it’s not for you, you could swap it for normal kale or spinach in this recipe. 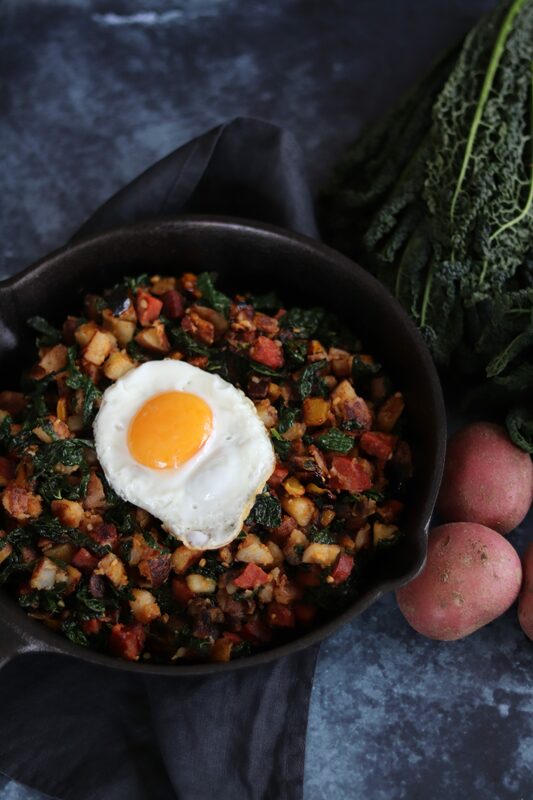 You could easily have this Chorizo & Cavolo Nero Hash for brunch, lunch or dinner. It is very versatile and also easy to cook for a lot of people. It also is great for leftovers. I quite like to make more than we will want to eat and have it for lunch the next day (minus the egg!). Make sure you wash the cavolo nero thoroughly. This entry was posted in Dinners on January 27, 2019 by Curly. I love how this looks! So fresh and healthy. Absolutely needs to be made in my kitchen asap. Thanks 🙂 It is really tasty even if I say so myself! As huge fans of chorizo, this would definitely be something I could see everyone in my house enjoying! Although the kids might try to avoid the cavolo nero! Haha hopefully they’d try it and realise cavolo nero is tasty too! It’s so delicious isn’t it! I can’t get enough of it at the moment. Looks gorgeous and so nutritious too! Pinned! This looks so delicious. I could eat this for my breakfast too. Healthy and yummy. Oh definitely, it is great for any meal of the day! I love these kind of meals! Especially with an egg on top! Chorizo is such a wonderful thing isn’t it? !